Home Columns Trailering Ready for the road? Too many trailer boaters — lulled into complacency by short trips to their local launch ramp — are not properly prepared for longer road trips. By now, if you’ve been reading this column regularly, you should appreciate the wisdom of greasing your trailer’s hubs and checking your brakes regularly. You should also check the operation of all your trailer’s lights every time you hook it up. Replace bulbs as needed. 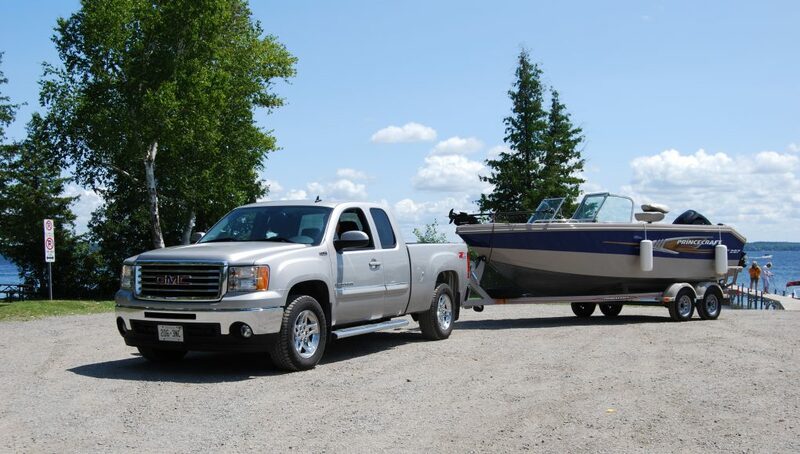 Early spring, well before your boating season begins in earnest, is the best time to check your trailer for wear and tear. You will still have time to complete necessary service. To check the hubs and brakes for noise, jack up each wheel in turn and give it a spin. If the bearings are loose or noisy, or the brakes stick, it’s probably time to install new bearings and service the brakes. Personally, I have no problem changing bearings but prefer to have professionals handle brakes; as with any DIY work, it’s your call. Before a particularly long road trip (to Florida and back), I replaced the bearings on both trailer wheels, just in case. The ones I removed didn’t look bad, so I kept them in case of an emergency. The maxim about an ounce of prevention applies aptly to boat trailers. So keep a grease gun loaded and ready in case your trailer’s hubs need a top-up before you head for the launch ramp, or at regular intervals during a longer road trip. But, no matter how well and thoroughly you prepare, equipment can still fail. Most often, it’s not the hubs or the brakes, but a tire that takes you down. Think back to the trailers and boats you have seen disabled on the roadside. The culprit is usually a flat tire. Prevention helps here as well, so while you are checking bearings and brakes in the spring, be sure to check your trailer’s tires carefully. Make sure tire pressures are correct and add or remove air as needed. If the treads are worn or sidewalls are cracked, replace the tires. Loosen the lug nuts on each wheel, then tighten them up, using a torque wrench as a gauge. Check the manufacturer’s specifications to get the right torque. Now you know the nuts are tight enough, but you can still remove them in an emergency. Check tires regularly during the boating season as well, with a cursory inspection and pressure check every time you are headed for the ramp and closer inspections before heading out on a longer trip. Beyond that, I feel much more confident having a spare tire mounted on the trailer and ready to use, plus an emergency kit. It doesn’t have to take up much space. Along with your tire pressure gauge, get a compact, portable 12-volt air compressor, a lug wrench and a bottle-jack. Add a couple of small pieces of plywood for blocking. It’s nice to be ready to recover from any roadside incident, but I am also realistic and understand that’s not always possible. So, a CAA membership with an RV endorsement (that will cover towing for a disabled trailer), is in my wallet.